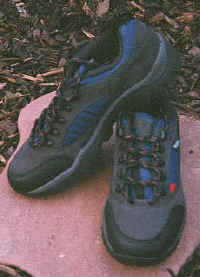 Berghaus Vertigo LO2 A supremely comfortable, lightweight shoe designed for summer trekking and with a sole stiff enough for mountain biking. We took our test pair straight out of the box and up Lochnagar on the last weekend of April and returned impressed. The Vertigo is very comfortable and performed well in a variety of conditions, from simple path walking to clambering over the rocks that litter the final section of the ascent on this fine Munro. The thick sole kept the upper clear of shallow surface water, such as puddles and burns running over tracks, while offering good 'stick' on rock or damp grass. It also offered excellent shock absorption and was comfortably stiff. The upper is made from oiled Nubuck and is suitably hardwearing. Below this is a a Dritex lining which is designed to wick moisture away from the foot. There's a firm heel grip, good cushioning and a rubber bumper to protect the toes. Overall, very comfortable and the styling is understated, but attractive. The future of summer trekking footwear, and it's here already! Available in sizes 39 to 47 in black/granite, dark khaki and midnight blue/navy (pictured). £50. A women's version is also offered. The North Face Kuna Trail The Kuna Trail is designed for aggressive trail running in a variety of conditions. The upper is a highly breathable mesh with wicking linings for comfort and the reinforced box-toe provides front-end protection. Double overlays of synthetic leather offer excellent support over the instep and durability. Underfoot there's a dual-density EVA midsole which uses X2 inserts under the heel and ball to ensure improved cushioning and TNF's Roll Control medial heel wedge helps control the position of the heel. The tread is design for maximum grip and traction when running. That's the science bit over, now our thoughts. This shoe may have been designed for the 'aggressive' trail runner (where's all this aggression come from? 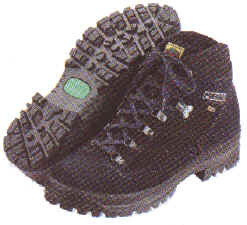 ), but we found it to be a fine alternative for dry-weather summer trekking. It's not unlike a trainer in its appearance, but offers considerable advantages in terms of support and cushioning. The sole is a good inch and a half thick under the heel and all those technical bits mentioned earlier do their job very well, providing a good solid, comfortable fit with brilliant shock absorption. They're wonderfully light too. Available in men's sizes (6-12) in stone/canary yellow (pictured) and driftwood/rainier blue and women's sizes (3-7.5) in driftwood/cool mint. £55. Karrimor KSB 200 Karrimor's KSB led the way as the original lightweight fabric trekking boot back in the days when most folk were hiking throughout the year in good, old fashioned leather. Many have since followed in its hallowed footsteps, but the KSB continues to hold its place as a firm favourite, and with good reason. 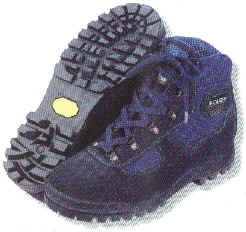 It's very comfortable boot which we took to the hills and wore straight from the box with no adverse effects. The KSB features a full Gore-Tex liner, suede/Cordura upper and Karrimor's own Frameflex midsole with a good sturdy dual density Vibram Bifida sole. There was no question about its waterproof performance as we returned home dry of foot. 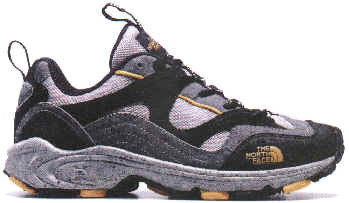 The sole also had plenty of flexibility for comfort and was solid enough to soak up varying underfoot terrain, from stony tracks to muddy moorland. To ensure as comfortable a fit as possible, the boot is supplied with volume adjustors. 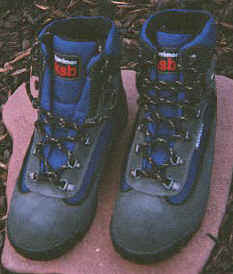 Ideal for three season hillwalking in Scotland and proved well able to take anything in its stride. Available in sizes 8 to 11 (including half sizes). £100. Meindl Lermoos A very versatile waterproof boot suitable for two season hillwalking and capable of taking wet and muddy conditions in its stride. The boot has a suede upper, Cordura panels for breathability and a full Gore-Tex lining to keep your feet dry. This is a very comfortable boot and has been worn in a variety of conditions, right up to walking through soft Spring snow. The double density sole is fairly flexible and hard wearing. We've used it frequently on track and tarmac for over a year and there's no significant signs of wear and tear on the bottom. It also soaks up bumps and ridges in the ground. Our only gripe is the lacing arrangements. The top fasteners are too close together on our size eight which makes lacing frustrating if you're in a hurry. We've fastened up, only to find the lace slipping off one of the fasteners, forcing a quick pit-stop. Otherwise, a beautifully comfortable summer boot. Available in men's (7-12) and ladies (4-8, inc half sizes) sizes. Navy blue only. £90. Scarpa Lite Trek Perhaps the best fabric trekking boot from Scarpa, this model features a Vibram Grinta sole and a suede/Cordura upper with full Gore-Tex lining. Built for use in the hills over three seasons, it feels more substantial than the Meindl Lermoos but is equally comfortable. The lace-up arrangements are better too, although we went through a pair of laces in less than a year - although these are easily and cheaply replaced. The sole is tough and the Comfort Flex midsole allows plenty of underfoot flexibility. It's proved waterproof in all but the worst conditions and has to be high on the list if you're looking for a fabric boot to see you through the summer. Available in men's (40-47) and women's (37-41) sizes. The male version comes in navy or black, while female walkers have to settle for navy alone (why can't women have the same range of choice?). £100. Karrimor: Petre Road, Clayton-le-Moors, Accrington, Lancs, BB5 5JZ. For stockists, call 01254 893000.